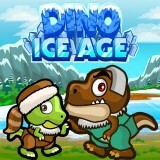 Control these two dinos and help them to reach the goal and pass each stage as better as possible. As you have understood, you must control both of them, so invite your bests and start the game right now. Is everything clear? So, have much fun and you will cope with it.